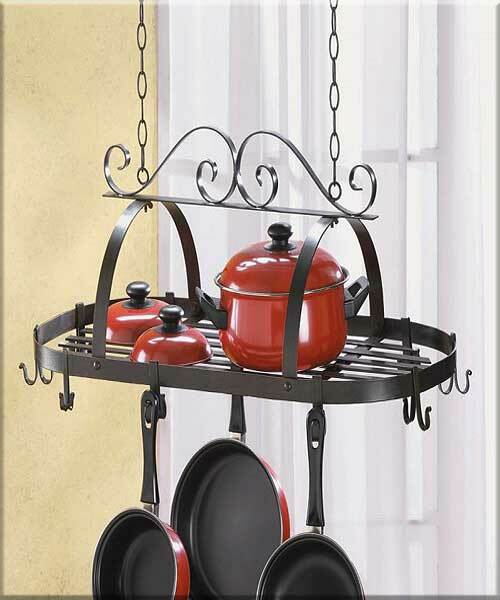 Stock# - 35603 Hanging Pot Holder - An intricate swirl design makes this wrought iron hanging pot holder with 10 hooks a useful work of art for the kitchen. 31 5/16" x 15 7/8" x 11 13/16" high. 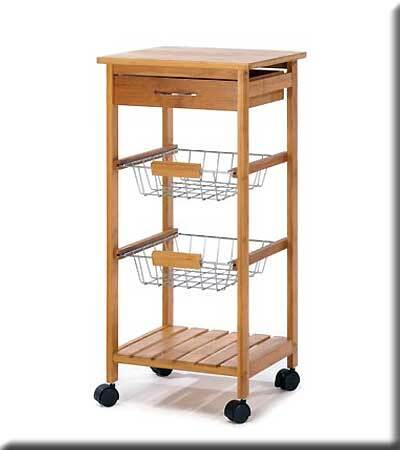 Stock# - 14710 Osaka Kitchen Cart - Attractive rolling cart complements any gourmet kitchen! The perfect fusion of fashion and function, with a sleek tower silhouette containing a solid bamboo top, utensil drawer, two baskets and a bamboo shelf. Bamboo and chrome plated metal. Some assembly required. 14 1/8" square x 30" high. 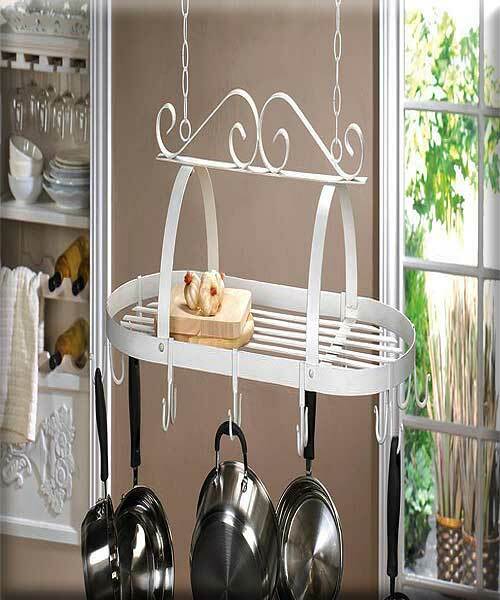 Stock# - 15252 Scrollwork Hanging Pot Holder - Keep your pots and pans within easy reach with this lovely hanging holder. Scrolling white metal and a slated center for additional storage, this hanging rack will free up in-demand cupboard space. 31 3/8" x 15 7/8" x 11 7/8" high. Wrought iron. 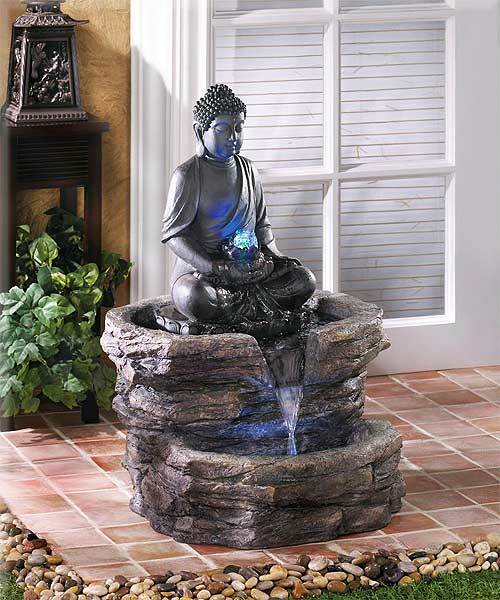 Stock# - D1156 Zen Buddha Fountain - Buddha in repose is the timeless image of Zen serenity, shown here as a sophisticated centerpiece surrounded by water s gentle flow. An elegant decoration that instantly turns any garden into a tranquil retreat! Submersible electric pump included. Poly resin. 21 1/8" x 20 1/8" x 29 3/8" high. Due to the size and weight of this item, we are ONLY able to ship it within the Continental United States, to physical address locations, and only via UPS Ground. Stock# - 36998 Contemporary Lamp Trio - Sleek lines and a classic Colonial silhouette come together beautifully in this striking lamp trio! Whether your d�cor is historically elegant or ultra-hip, these tasteful silver fixtures are a seamless fit. Metal base with fabric shade. Small lamps require 40-watt bulbs (not included). Large lamp requires 100 watt bulb (not included). 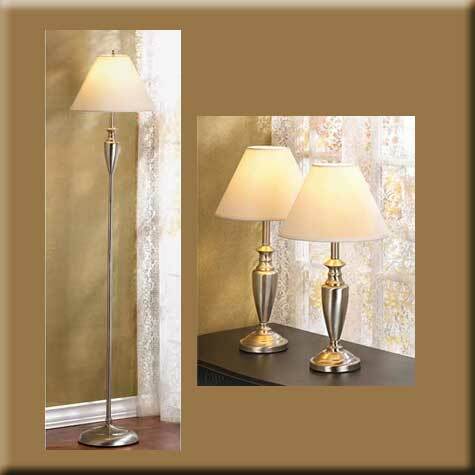 2 Table lamps 10" diameter x 18 1/2" high Floor lamp 14" diameter x 63 1/2" high. Set of 3. UL recognized. 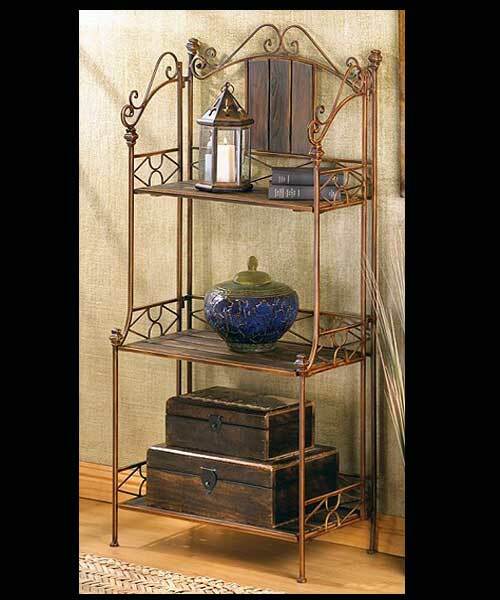 Stock# - 12516 Rustic Baker's Rack Shelf - Baker's rack has just the right mix of rustic romance and roomy shelving! An attractive showcase for decorative treasures, or an ample storage spot for everyday items; blends perfectly into your decor. Wood and metal. Contents not included. Price includes free shipping.